VERONA, N.Y. – In an ESPN Friday Night Fights main event on International Boxing Hall of Fame induction weekend, featuring a pair of fighters celebrating their 33rd birthdays tonight, 2004 Olympic silver medalist Yudel Jhonson (16-1, 9 KOs) captured the vacant World Boxing Council (WBC) and North American Boxing Association (NABA) by winning a unanimous 10-round unanimous decision (97-91 X3) over former Mexican champion Norberto “Demonio” Gonzalez (20-4, 13 KOs). The entertaining top-to-bottom show was presented by Iron Mike Productions (IMP) at Turning Stone Resort Casino in Verona, New York. Supporting promoter Mike Tyson at tonight’s fights were world champions Oscar de la Hoya, Andre Ward, Zab Judah, Felix “Tito” Trinidad, Leona Brown and actress/boxing fan Rosie Perez. “It was a great night, I’m very proud,” Tyson remarked. “This was better than our first show here and the next time will be even better. It’s all about consistency. We saw some great fighters tonight and the fans were great, too. These guys make me look good, I’m honored. Jhonson, a stylist Cuban southpaw living in Miami, boxed his way to victory, decking Gonzalez with a short left in the fifth, buckling him in the sixth, and dropping him with a left in the ninth round. Red-hot welterweight Sammy “The Who Can Mexican” Vasquez, Jr. (15-0, 11 KOs) proved once again why he’s one of the most fan friendly fighters in boxing. In the ESPN co-feature, the aggressive southpaw from Monessen, PA attacked like the Iraq War veteran he is, dropping “Smokin'” Jay Krupp (17-7, 8 KOs) in each of the first three rounds, after which referee Benji Estevez halted the action at the 1:19 mark. A star was born in the ESPN FNF opener as heavy-handed middleweight sensation Ievgin “The Ukrainian Lion” Khytrov (5-0, 5 KOs) stepped up in class against dangerous Chris Chatman (12-4-1, 5 KOs) and passed the test with flying colors. After a “feeling out” opening round, the 2012 Ukraine Olympian went to work, battering a game Chatman until a powerful, short left hook ended the fight in the third round. 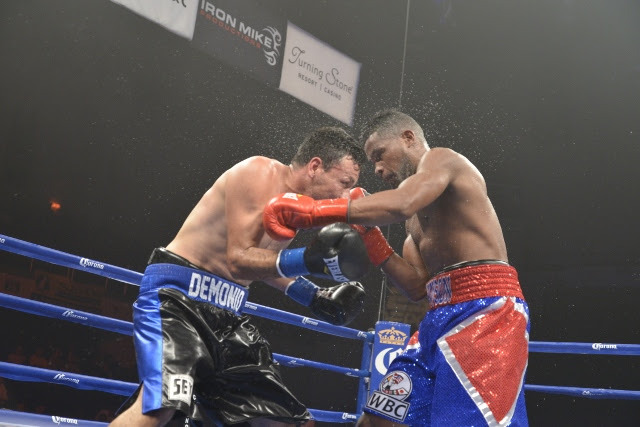 Detroit light heavyweight Isiah Thomas (13-0, 6 KOs) remained unbeaten, blanking (80-72 X 3) Pittsburgh veteran Rayco “War” Saunders (23-24-2, 10 KOs) for an eight-round decision. Charlotte junior welterweight John Williams (12-3-1, 5 KOs) upset Johnny Garcia (19-2, 11 KOs) by way of an eighth-round split decision (77-75, 77-75, 76-76) for the vacant WBC Latino title. Former standout amateur Ryan “Blue Chip” Martin (6-0, 3 KOs), who is promoted byCurtis “50 Cent” Jackson, outclassed Brooklyn lightweight Ian James (2-8-1, 1 KO) en route to a unanimous four-round decision (60-54 X 3). Detroit light heavyweight Leo Hall (2-0, 2 KOs) needed only 49-seconds to knockout Bob Wilder (2-4, 1 KO), dropping him with a vicious left kook. NORBERTO GONZALEZ (20-4, 13 KOs), Monterrey, Nuevo Leon, Mexico 154 LBS. For additional information go online at www.IronMikeProductions.com, friend on Facebook atwww.Facebook.com/IronMikeProductions.Official, or follow on Twitter @IronMikeProd.